This fuel gauge is a perfect replacement for your Bullet boat. Available in White or Black bezel. This gauge replaces your factory Bullet water pressure gauge. Available in Black or White bezel. 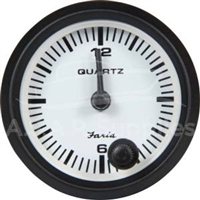 This is the factory replacement for your Bullet Tachometer Gauge. This Gauge is good to 8000 RPM's and features the "Bullet" logo at the bottom of the dial. Available in Black with gray face or White with white face. This is the factory replacement for your Bullet Engine Temp Gauge. This Gauge is good to 250 Degrees and features the "Bullet" logo at the bottom of the dial. Available in Black with gray face or White with white face. This is the factory replacement for your Bullet Engine Trim Level Gauge. This Gauge is allows you to track the trim level of your motor while running. Available in Black with gray face or White with white face. This valve switch controls the flow of fuel for Bullet boats built with a single auxiliary tank, also known as a saddle tank. If you are unsure if this is the part you need please don't hesitate to call us at Bullet Boats 865-577-7055. This is the factory replacement for your Bullet Speedometer Gauge. This Gauge is good to 100Mph and features the "Bullet" logo at the bottom of the dial. Available in Black with gray face or White with white face. This valve switch controls the flow of fuel for Bullet boats built with a dual auxiliary fuel tanks, also known as saddle tanks. If you are unsure if this is the part you need please don't hesitate to call us at Bullet Boats 865-577-7055.